Welcome to the EVOLUTION of GROUT & THIN-SET and the MIRACLE of modern flooring science! A Grout that never stains, is mold resistant & never needs sealing! 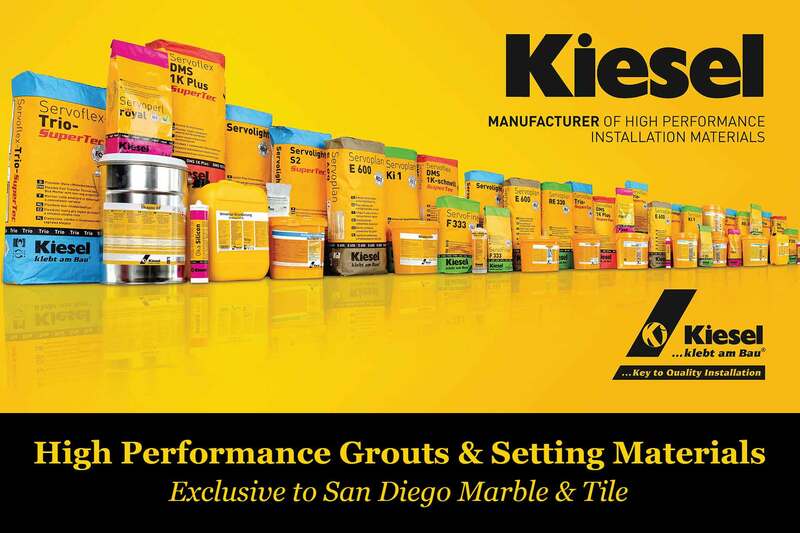 Kiesel ServoPerl Royal Grouts are the only Mold and Mildew resistant grout available (no other grout can make this claim.) The grouts are cement-based (no epoxy) and do not require sealing. They are stain resistant and have zero VOC emission - making it easy to maintain and safe for your family. Kiesel Bauchemie Grouts are ideally suited for low & high traffic, as well as dry & wet conditions, and in both residential & commercial applications. All your indoor, outdoor and swimming pool tile grouting installations made easy -- no hassle, no fuss! Kiesel ServoFlex (floor) and ServoLight (wall) thinsets are extremely smooth to work with & have TRUE zero non-sag characteristics - which honestly has to be seen to be believed. They are self-curing (does not require air to harden) and also have zero VOC emissions. The moisture-barrier primer (Kiesel Okatmos DSG) is a roll-on primer that allows you tile over any surface (glass, concrete, existing tile, wood, drywall etc.) without any further surface preparation; and it provides a moisture barrier which is perfect for basements and other damp areas. Floor grinding is now a thing of the past! Click here to learn more about Kiesel product preparation and installation. Exceptional tile installation adhesives, mortars and liquids - GUARANTEED! Manufactured locally. Supported locally. Trusted internationally! Always in-stock when you need it. 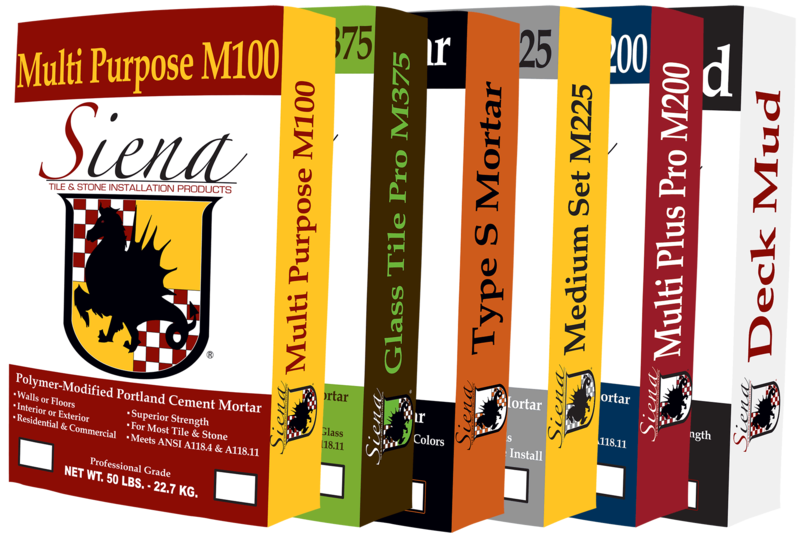 Siena is a local brand of Omega Products International. A niche supplier of very high-quality deck mud, mortar, thinset, wall float, and waterproofing membranes. Siena is a trusted supplier of San Diego Marble & Tile. They provide products that are superior in not only price but quality to many competitors; they are flexible enough to work with our contractors on custom orders and requirements. And of course, most importantly, they are there to provide on-site local support if and when you need it. Products you can trust. And if we don't have what you need - just let us know and we will source it! & safety products needed to complete your tiling project with quality. Deck Mud is a leveling mortar designed for interior or exterior floors or counter tops. It is used as an underlayment to reinforce or level, a surface prior to installation of pavers, tile or natural stone. Wall Float is a leveling mortar designed for wall or ceiling applications over metal reinforced lath or concrete masonry. Ideal for tile or natural stone installations when using the conventional and thin-set method. Thinset is an adhesive mortar made of cement, fine sand and a water retaining agent that allows the cement to hydrate and bond. It is used to attach tile or natural stone to surfaces such as cement or concrete. Grout is cement-based and is used for filling the gaps between wall or floor tiles. It comes in a large variety of colors to match the tile color as it is visible after installation. It comes in both sanded as well as unsanded varieties. Premium, ready to use waterproofing & anti-fracture liquids, or Densshield tile substrate, to produce high quality elastomeric waterproof barriers. Liquids applied using a trowel, roller, paint brush or sprayer. We stock all the rough materials you require to complete your tiling project, no matter what the surface, area or place. If it can be tiled we have the product and support that you need. big dreams require creativity imagination, quality materials & precision tools.